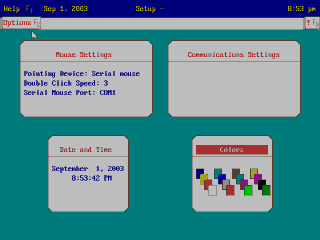 Tandy DeskMate is a desktop environment that integrates with a number of useful bundled applications. 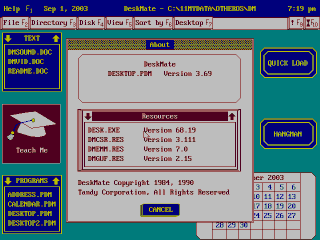 DeskMate was sold by Tandy / Radio Shack and developed primarily for their TRS-80s and Tandy 1000 PC compatibles. The first versions used text mode only and were available for Tandy PC and TRS-80 computers. Later versions were graphical and ran on the Tandy 1000 series PC. 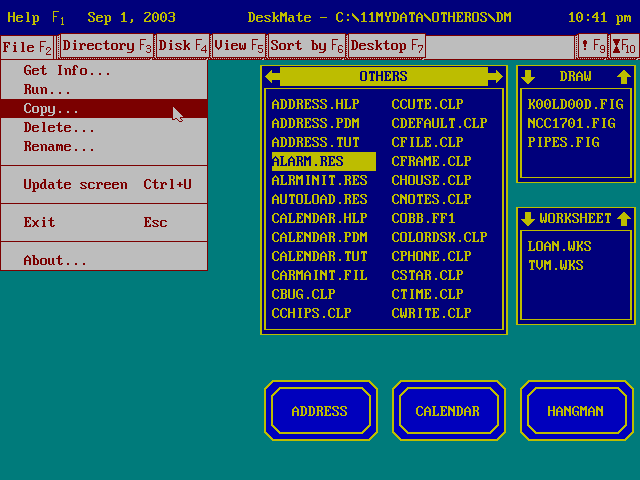 Several models of Tandy 1000s even included DeskMate in ROM. Some versions were Tandy 1000 specific and would not run properly on other brands of PC compatible computers. DeskMate 3 runs on top of MS/PC-DOS and is roughly on the same level with GEM, Visi-On, or Windows 2.0. A significant number of third parties made applications available for DeskMate 3. This included a port of Lotus 123 V2.01 as well as applications from Broderbund and PFS. This specific version of DeskMate is 3.05. However the "About" dialog shows the version number of the desktop shell program, which is 3.69. 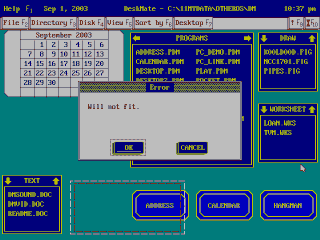 The DeskMate desktop contains various "menus", as it calls them, that can be hidden, shown, moved or customized. "Menus" may include "quick load" file selection menus for specific applications, buttons to launch applications, a calendar, a to-do lists, a phone list, and a tutorial. 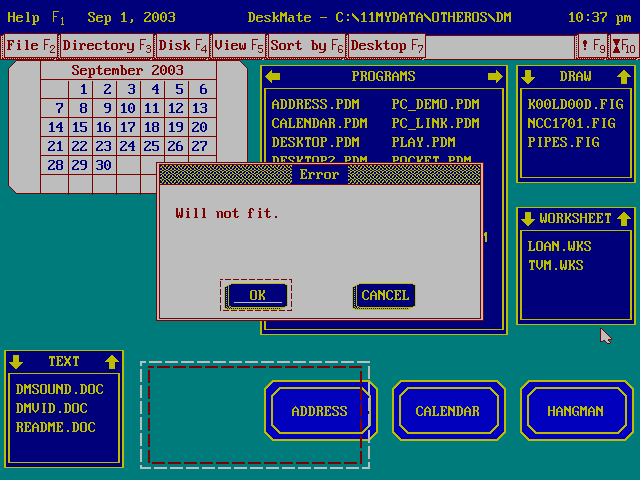 The text-based origins of DeskMate are apparent in the design of the desktop. 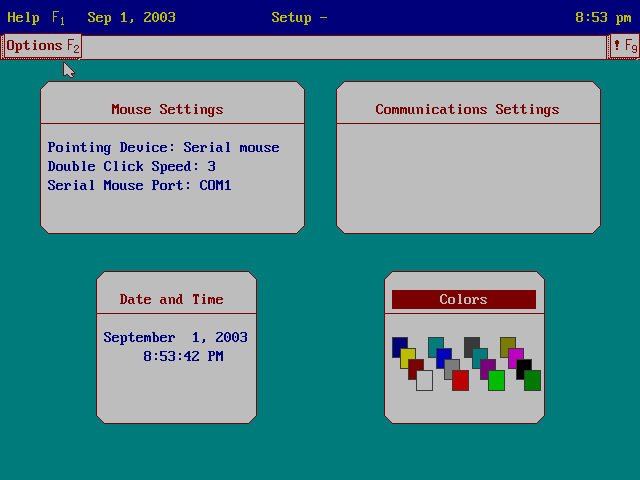 Most of the applications use the same screen font (appears to be the bios font), everything aligns to a grid, there is no drag-and-drop, and graphics are sparse. As a result DeskMate has a bit of a klunky feel to it and often is not very user friendly. Items on the desktop can be moved around, added or removed using "desktop" menu. You remember how the Mac came with a slide puzzle? Well, in DeskMate the entire desktop is a slide puzzle. Desktop items can be moved around but they can not overlap. 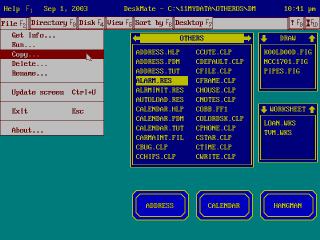 File lists in the quick load menus can be managed using the file options from the menu. This is rather limited as it is not possible to work with subdirectories here and all quick load menus only look in the current directory. 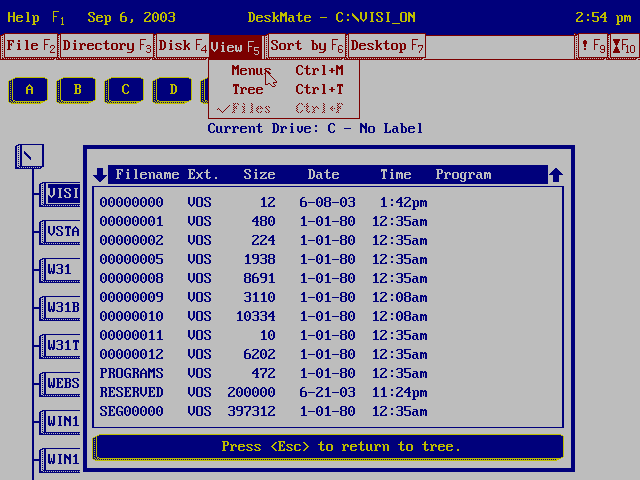 This is the DeskMate tree/file view. 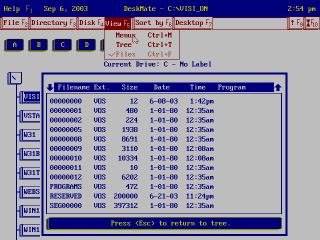 It displays a list of drives and an expanded tree of all directories on the drive from which you can view the files. The files are managed in the same way as shown above. This is the DeskMate options setup. There are more advanced options under the "options" menu for communications, colors, mouse, data and time, printers, and a screen saver (screen blanker actually). 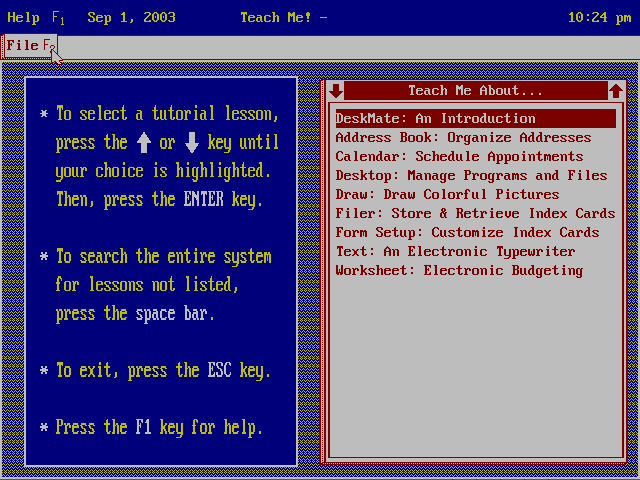 One of the more notable features about Tandy DeskMate is the built in tutorial. It will walk you through a fully animated demonstration of each included application.